Imec, world-leading research in nano-electronics, Holst Centre and the lab of Neuro- and Psychophysiology at the Katholieke Universiteit Leuven today present the Mind Speller, a portable, easy-to-wear, intelligent textual and verbal communications prototype device enabling people with motoric disabilities (suffering from for example brain paralysis or speech or language disorders) to communicate. 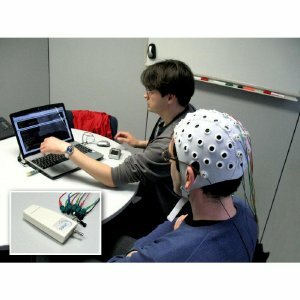 The Mind Speller is a EEG(electro-encephalogram)-based device that interprets brain waves to spell words and phrases. It detects and interprets P300 event-related potentials in the EEG-signals of a person that is selecting characters from a display presenting alternate rows and columns of characters. P300 potentials are often used as metrics of cognitive function in decision making processes. However, currently available P300 devices are large, expensive and uncomfortable in use. The Mind Speller, on the other hand, uses a portable device, not larger than a matchbox, connected to a cap that contains electrodes located at specific positions on the head to capture the relevant EEG-signals. The electronics in the matchbox are developed by imec and Holst Centre. It contains imec and Holst Centre’s proprietary ultra-low power 8-channel EEG-chip to process the EEG signals, a commercially available low power microcontroller that digitizes the EEG signals and a low power 2.4GHz radio that transmits the EEG signals wirelessly to a nearby PC. The data is interpreted on the PC by powerful and robust signal processing algorithms developed by the team of Prof. Marc Van Hulle at the lab of neuro- and psychophysiology of the Katholieke Universiteit Leuven . Currently, accurate solutions are available on the market to help people to communicate despite severe impairments. These solutions rely on either eye-tracking technology or laser pointing. However, they are subject to long and vulnerable calibration procedures and they are very expensive due to the technology used and the need for tailor-made solutions. “The Mind Speller is a generic device that can easily be adjusted to different users. Therefore, it could become a cost-efficient communication solution for people with temporal impairments for whom the existing solutions are too expensive. Moreover, the Mind Speller may help those patients that are not helped with the existing devices driven by motoric activity, as the Mind Speller is based on a different principle, using P300 EEG potentials to read people’s ‘thoughts’”, says Prof. Marc Van Hulle from the lab of neuro- and psychophysiology at the Katholieke Universiteit.